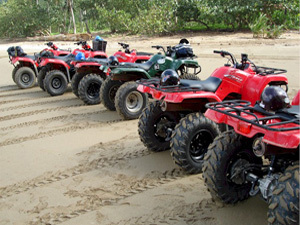 ATV Adventure Samana - ATV Tours and Excursions in Samana Dominican Republic. 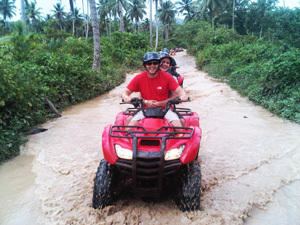 Quad & Four Wheeler Tour in Samana Peninsula. Our Most famous Excursion of All ! 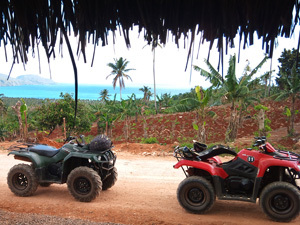 We pick up you directly at the Hotel Reception any where in Samana, Las Terrenas and Las Galeras in our Air Conditioned Bus to travel to the ATV Base, where you will receive a safety briefing about how to operate your ATV and where you will meet your friendly and knowledgeable guide Melvin Moya. After you will get ready to go cross country and see Samaná Peninsula from up close. You'll drive your ATV Vehicle trough some rugged terrain and we'll visit a Dominican family where we will make a quick stop to take some pictures and drink a good Dominican coffee and enjoy delicious natural chocolate. 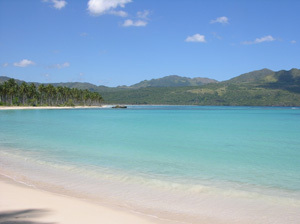 After we continue accross Samana Peninsula to visit one of the most exotic places in the region, one the most beautiful beach in the Caribbean, still virgin, World famous " Playa Rincon ". 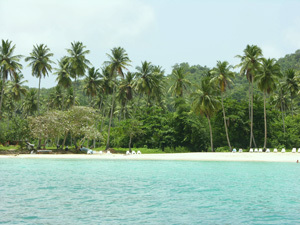 Where we will stop around 1 hour and 15 minutes to enjoy the magical white sand and the crystal clear turquoise waters of Playa Rincon. There you can rest, drink, swim, explore, or just lie in the sun if you wish. Then it's off to the small river of "Caño Frio" for some more swimming in clean fresh water or just make some pictures of the beautiful area. 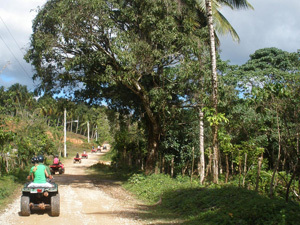 After we drive our ATV's accross the hills of Samana Peninsula to go back to our ATV Base in Los Naranjos. 4.5 HOURS OF PURE FUN AND FULL ADVENTURE ! ADULTS : 10% DISCOUNT when Booking Online ! Recommendations: Wear a hat and sunglasses, and of course bring your bathing suit and a towel. 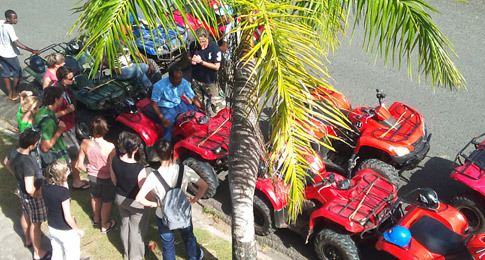 We pick up you directly on the port of Samana, in our Air Conditioned Bus for a 25 minutes travel to the ATV Base, where you will receive a safety briefing about how to operate your ATV and where you will meet your friendly and knowledgeable guide Melvin Moya. After you will get ready to go cross country and see Samaná Peninsula from up close. 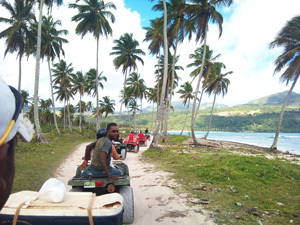 You'll drive your ATV Vehicle trough some rugged terrain and we'll visit a Dominican family where we will make a quick stop to take some pictures of the nice view of Rincon Bay, drink a good Dominican coffee and enjoy delicious natural chocolate. After we continue accross a little Village where you can enjoy the warmth of the native Dominican people on the road to visit one of the most exotic places in the region, one the most beautiful beach in the Caribbean, still virgin, World famous " Playa Rincon ". Where we will stop around 1 hour and 15 minutes to enjoy the magical white sand and the crystal clear turquoise waters of the beach of Playa Rincon. There you can rest, drink, swim, explore, or just lie in the sun if you wish. Then it's off to the small river of "Caño Frio" for some more swimming in clean cool fresh water or just make some pictures of the beautiful area. After we'll drive our ATV's accross the Samana Peninsula to go back to our ATV Base where we will board our Air Conditioned Bus to take us back to the Samana Port. 4 HOURS OF PURE FUN AND UNFORGETABLE ADVENTURE ! Children Ages are: 6 to 12 years old. Recommendations: Wear a hat and sunglasses, and of course bring your bathing suit and a towel. Also bring some money to buy a gift in the Dominican family or just to give a tip. Not recommended for: Children under 6, the physically handicapped, people with vision problems, pregnant women, person with problem in the right hand, people who can't drive. Allowed ages are from 16 to 60 years old. Tour starts around 9:15 am and no later than 9:30 am. at a maximum 1:45 pm. before last tender to ship.